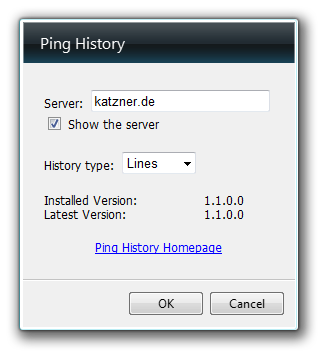 Ping History is a Windows Vista / Windows 7 Sidebar gadget which displays a ping history. In the settings dialog you can choose which server Ping History should use to collect its data. The gadget then tests periodically how well this server is reachable at the moment from your Internet connection. Ping History estimates the round-trip time thereby in milliseconds and draws a graph of the last 2 minutes. In the upper right corner you can see the most recent round-trip time and the highest round-trip time which occurred in the last 2 minutes. Ping History is an invaluable tool if you need to keep an eye on a specific server or your overall network performance (for ambitious network applications like VoIP or online games). Version check in Settings Dialog. Copyright © 1977-2277 Sascha Katzner. All rights reserved.